Have you heard about the Cocker Pei? Are you wondering if a Cocker Spaniel Shar Pei mix puppy is right for you? 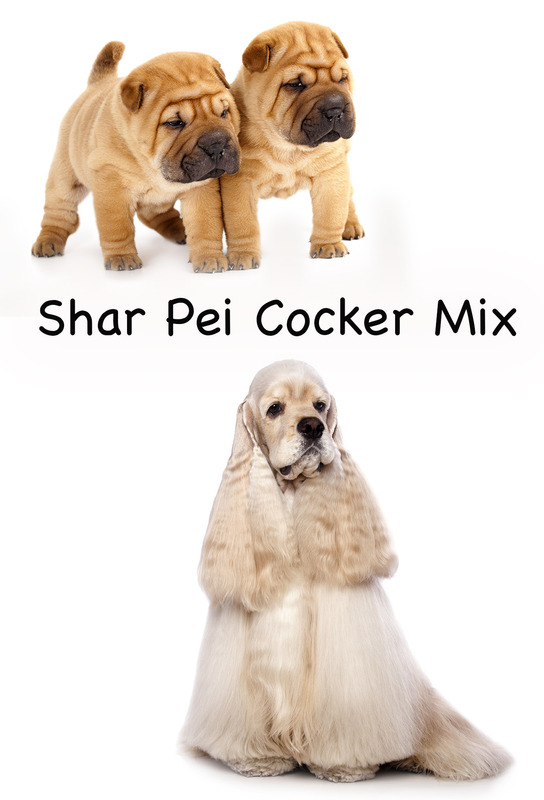 Welcome to our complete guide to the Cocker Spaniel Shar Pei mix! The Cocker Spaniel Shar Pei mix is the result of a Cocker Spaniel cross Shar Pei. Here we will learn about this intriguing breed cross and explore what you should expect when choosing one. Cross breeding is a highly controversial subject and so we will firstly look at the debate surrounding the designer dog. Often referred to as a first generation mix, designer dogs have become extremely popular. It’s certainly not unusual to see so-called designer dogs such as the Cockerpoo or Labradoodle racing around the park. But is cross-breeding a good idea? Should we really play with nature to create hybrid breeds of our choice? Crossbreeds, or mongrels as they were commonly known, have been around forever. However, first generation mixes are rather different as they are created using two chosen purebred parents. It is claimed that widening the gene pool will reduce the chance of inherent health issues and diseases. You may have heard of the term ‘hybrid vigor’, which suggests that crossbred puppies will have superior qualities to their parents. Pedigree enthusiasts, on the other hand, argue that the lines of breeds should remain pure. They completely oppose mixing genes and aspire to produce healthy pedigree puppies which conform to breed standard. Whichever opinion you hold it is, of course, impossible to predict which parent the Cocker Pei puppies will take after. Therefore, it is important that we look at each breed individually. The Cocker Spaniel, which was bred in England for hundreds of years, can be traced back as far as the 14th Century. Spaniel, it is claimed, means “Spanish dog,” suggesting that the breed originated from Spain. Thought to have been brought to the United States in the 1620’s, they were at the time divided into two categories, the land and the Water Spaniel. Land Spaniels became further divided by size- Cocker Spaniels are the smallest of the Sporting Spaniel group. The word “Cocker” comes from the woodcock, which the dogs enthusiastically flushed out for their hunting masters. Notably, the American Cocker is very different from its cousin, the English Cocker Spaniel, and they are officially separate breeds entirely. The American Spaniel Club was formed back in 1881, actually pre-dating the American Kennel Club. It is thought that the Shar Pei originated from a small village named Tai Lai, in the Kwangtung Province of Southern China. There are those who claim that this ancient breed can be dated back to the Han Dynasty, around 200 B.C., as statues with a strong resemblance to the Shar Pei have been found from this period. It is unproven, though, whether these statues are of the Shar Pei or the Chinese Chow Chow. Shar Peis were originally guarding and fighting dogs, unfortunately, they didn’t fare well in more recent times. Once the People’s Republic of China was created in late 1949, the country’s dog population was virtually wiped out. A small number of Shar Pei’s were bred in Hong Kong and Taiwan, but these were very few in number. The Shar Pei really has one man to thank for its salvation. Matgo Law of Down-Homes Kennels in Hong Kong appealed to dog lovers in the USA to save the Chinese Shar Pei and the results were surprisingly positive. Soon, a number of Shar Peis were shipped to the country and in 1974 the Chinese Shar-Pei Club of America was formed. Little is known about the origins of this modern designer breed. Crosses are often bred for desirable looks, but it’s difficult to judge which of his parents the Shar Pei Cocker Spaniel mix will resemble or inherit his characteristics from. To get an idea of what is likely, let’s now analyze these breeds further. The Cocker Spaniel typically stands at 13.5 to 15.5 inches at the withers. The dog should be of a stocky build and ideally weigh between 20 and 30 pounds. The somewhat larger Shar Pei stands at 18 to 20 inches tall and should weigh between 45 to 60 pounds. The Shar Pei is a sturdy dog of a medium build. A Cocker Shar Pei mix, therefore, could be anywhere in between. The coat of the Cocker Spaniel should be silky and flat or slightly wavy and of a medium length on the body, ears, and legs but short on the head. They can show a range of colors, from black or cream, browns to reds, or parti-color (two or more colors, one being white). Their eyes are large, dark brown, and persuasive. The tail should wag happily when in motion. The most noticeable trait of the Shar-Pei has to be its loose, wrinkled skin. The coat is short and harsh to the touch and comes in a number of colors including black, browns, creams, and reds. Ears are tiny in comparison to the muzzle size and triangular in shape. Set high and wide, the ears lay flat against the head. Their glaring eyes are small, dark, and almond-shaped. The curled tail is set high, is thick at the base and tapers towards the tip. The Shar Pei has a remarkable blue-black tongue which is shared only with the Chinese Chow Chow. Whatever characteristics the puppy inherits, he is sure to be a striking pup. Grooming requirements are high with the Cocker Spaniel, to ensure that he looks and feels his best, and so owners must be ready for this. Daily brushing is essential to keep the coat free from mats and tangles and professional grooming is recommended every six to eight weeks. The Shar Pei, however, is fairly low maintenance in terms of grooming and a thorough brush once a week should suffice. The wrinkles should be kept clean and dry to avoid infection and irritation. Nails and ears should be checked weekly to avoid overgrowth and any buildup of wax. This is especially important with the Shar-Pei due to his unusually small ear canal. Regular tooth brushing is also a necessity. A gentle and cheerful dog, the Cocker Spaniel has been one of the most popular breeds for decades. He is sweet and friendly and, as long as socialized early, he does well with other dogs and children. Devoted to his human, he can become possessive or jealous when not receiving the attention that he thinks he deserves. The Shar Pei is an independent and confident breed. He is very loyal but can be aloof with strangers. It is essential that the Shar-Pei is socialized early as he can have a tendency to be aggressive with other dogs. Both were skilled working dogs and their desire to hunt remains. Because of their high prey drive, it is advisable to keep them on a leash when out and about. Do remember that the Cocker Pei could take on the temperament of either of its parents or even some of each. Cocker Spaniels are, in the main, healthy dogs with few health issues to look out for. Eye problems are probably the most common and these include Hereditary Cataract (HD), Glaucoma, retinal dysplasia, and Generalized Retinal Atrophy. Hip Dysplasia and Patellar Luxation may also be seen. Unfortunately, there are quite a number of health concerns with the Shar Pei. The Chinese Shar-Pei is classified as a brachycephalic breed which, in simple terms, means that he may experience breathing problems due to the size and shape of his nose and head. This breed can suffer from several skin problems such as Demodectic Mange, caused by mites, as well as skin infections and irritations. Another concern, unique to the breed, is Shar Pei Fever, otherwise known as Swollen Hock Syndrome. In the last decade, both skin conditions and Shar Pei Fever have been attributed to the HAS2 gene found in this breed. Therefore, it stands to reason that we should be able to breed out or at least reduce the incidence of both conditions by cross-breeding. Unfortunately, at this time, there appears to be no firm evidence that this has been successfully achieved. Shar Peis can be prone to eye complications such as Entropion, Glaucoma, Retinal Dysplasia, “Cherry Eye,” and SARDS, or Sudden Acquired Retinal Degeneration Syndrome. As with many dogs, Hypothyroidism seems to be relatively common. The Cocker Pei will need a moderate amount of exercise but may become tired over time. You will need to make sure that he doesn’t overheat. The Shar Pei cross Cocker Spaniel will be eager to please and so should be reasonably easy to train. He may be strong-willed but will respond well to positive reinforcement instruction. As with all breeds, early and regular socialization, with all types of people and dogs is vitally important to help your puppy become a well-rounded adult. The Cocker Pei will be devoted to his family but may be possessive at times. He will be a loving and affectionate companion and will be good with children who are respectful of him. 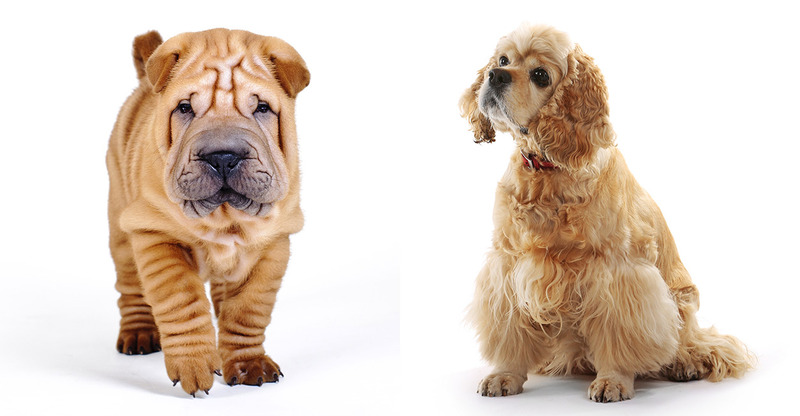 The Shar Pei does better at being alone than the Cocker Spaniel, but both may become noisy or destructive when bored. Therefore, he would be best suited in a household where he will not be left on his own for long periods. The Cocker Pei would make an excellent pet for a family with older children. You will need to research thoroughly to find a reputable breeder. Puppy mills are very real and it is imperative that you do not buy from such a breeder for the welfare of these breeds and others. With any crossbreed, it is important to ensure that both breed parents are healthy and are of satisfactory temperament. It is crucial that a breeder provides proof of health screening and scoring for each breed condition. The parent Cocker Spaniel should have a hip and elbow evaluation and a recent clear eye test. The parent Shar Pei should also have hip, elbow, and eye tests, as well as patella and thyroid screening. Ask lots of questions and make sure that you are happy with every answer. Only then should you consider choosing a Cocker Pei puppy. Warnock et al. 2003. Retrospective Analysis of Canine Miniature Total Hip Prostheses Veterinary Surgery. Barnett. 1978. Hereditary cataract in the dog. Journal of Small Animal Practice. Bedford. 1977. A gonioscopic study of the iridocorneal angle in the English and American breeds of Cocker Spaniel and the Basset Hound Journal of Small Animal Practice. Peterson-Jones. 1998. A review of research to elucidate the causes of the generalized progressive retinal atrophies The Veterinary Journal. Mostafa et al. 2008. Proximodistal Alignment of the Canine Patella: Radiographic Evaluation and Association with Medial and Lateral Patellar Luxation Veterinary Surgery. Vaysse et al. 2011. Identification of Genomic Regions Associated with Phenotypic Variation between Dog Breeds using Selection Mapping PLOS Genetics. Caswell et al. 1995. Canine Demodicosis: A Re-examination of the Histopathologic Lesions and Description of the Immunophenotype of Infiltrating Cells Veterinary Dermatology. Zanna et al. 2009. Hereditary cutaneous mucinosis in shar pei dogs is associated with increased hyaluronan synthase-2 mRNA transcription by cultured dermal fibroblasts Veterinary Dermatology. Mutter. 1990. Skin Diseases of the Chinese Shar-Pei Veterinary Clinics of North America: Small Animal Practice. Olsson et al. 2011. A Novel Unstable Duplication Upstream of HAS2 Predisposes to a Breed-Defining Skin Phenotype and a Periodic Fever Syndrome in Chinese Shar-Pei Dogs Plos Genetics. Mason. 1991. Canine pyoderma Journal of Small Animal Practice. Reid & Broun. 2006. Entropion correction in dogs and cats using a combination Hotz–Celsus and lateral eyelid wedge resection: results in 311 eyes Veterinary Ophthalmology. Cook. 1997. Surgery for Glaucoma Veterinary Clinics: Small Animal Practice. Barnett. 1988. Inherited eye disease in the dog and cat Journal of Small Animal Practice. Mazzucchelli et al. 2006. Retrospective study of 155 cases of prolapse of the nictitating membrane gland in dogs Veterinary Record. Heller et al. 2016 Sudden acquired retinal degeneration in dogs: breed distribution of 495 canines Veterinary Ophthalmology. My dog Harley is a female shar pei and cocker spaniel. She is almost 2 years old. What kind of food should I be feeding her, she is constant scratching and biting. Allergies?